McDonald's has been changing its menu about as often as Lady Gaga will change her outfits during the Super Bowl halftime show. First it debuted new versions of the Big Mac in Mac Jr. and Grand Mac sizes. Now Mickey D's is changing up the Shamrock Shake -- a beloved seasonal treat -- with four brand-new, super-chocolaty shakes and hot drinks, according to Brand Eating. 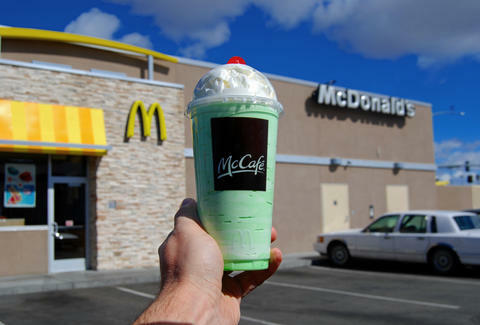 If you've dreamed of what would happen if McCafe took its Chocolate Chip Frappe and blended it with Shamrock Shake syrup, then your dreams are about to come true! It's also topped with green sugar crystals. We're most excited about this one because this is a brand-new concoction from McD's that's long overdue. It's a layered shake with Shamrock on top and chocolate on the bottom. And you better believe it has whipped cream, chocolate syrup, and those green sugar crystals. OK, it's not a shake. But it does have the minty Shamrock Shake syrup mixed with McCafe hot chocolate. Mint and chocolate is always a winning combo, so this should be great. This is another McCafe standard (the mocha comes with espresso, chocolate syrup, and steamed milk), but with that glorious Shamrock Shake syrup inside. Lee Breslouer is a senior writer for Thrillist, and can't wait to try these. Follow him to chocolate-covered everything @LeeBreslouer.